Established in 1947 and tested in the Oregon backcountry, Uncle Mike's has more than 60 years of experience producing tough, reliable gear for hunters and shooters. 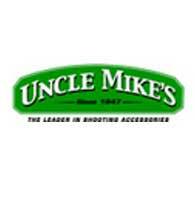 Crafted with pride and built to last, Uncle Mike's offers swivels, slings, holsters, ammo, gear holders and gun cases. Simply the finest in shooting accessories, Uncle Mike's gear rises to the challenge. For more information about Uncle Mike's products visit www.unclemikes.com. Uncle Mike's Brand Materials will be available soon. High resolution image downloads are available on each product's press release.